We have finally made it to the other side of winter, and spring is starting come upon us. We are now in that beautiful sliver of time where it is no too cold, or too hot. It is definitely time to enjoy our time outside. 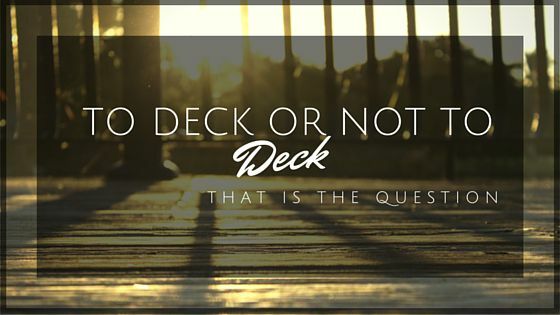 But the question rolling around in my head today is: To Deck, or Not To Deck? It is the dream of every home owner to have a backyard where they can relax. However, a plain backyard can sometimes be boring. For your enjoyment, here are 5 reasons we have put together for you to take in when you are choosing to build a deck. When you add a hardwood deck to your home, you are increasing your home’s value, and possibly your quality of life! When you install a deck, you can expect an average of a 60-70% return on your investment. Today, people are not as connected with the natural world as they are with the material world, more than any other time in history. Whether you have a Cape Cod style home or a Ranch style home, a deck is a great way to connect with nature. The smell of the flowers you have planted, the sound of birds calling to their young, wind chimes, or just simply relax and meditate! Life is not simple, but having a deck can give you a way to escape easily from the hustle and bustle of everyday life, and give you that much needed peace and quiet. Having a deck is great for family functions! Have a BBQ outside with your extended family, have a small dinner with your friends. Either way, you will be connecting with your friends and family in the outdoors, with great food and music! Some deck materials are perfect for ice and snow while others are great for year-round warm weather. These include brass, stainless steel, and various types of wood. 5) Decks Are a Good Way to Customize Your Yard! You can go out and buy that outdoor wicker furniture that you have been eyeing all year long! It would look fantastic with whatever deck style you go with. This means that you have the discretion to give your yard that chic yet professional look. When you are in the process of building a home with Toback Builders, please let us know if you want to install a deck! We will make sure that you get the quality materials needed for the look you desire. Come take a look at our show room, Monday-Friday from 10AM – 3PM. If you have any questions, please give us a call! Or just comment below and let us know what you think!